Located 8 km from the city of Privas, and set in a building from the 13th century, Château de Rochessauve offers a swimming pool in its large garden and a terrace. Wi-Fi access is available in the public areas. The rooms at Château de Rochessauve are uniquely decorated and have a private entrance. Some have a private terrace with a view of the valley and some have a walk-in shower. A continental breakfast that includes homemade marmalade is provided. Guests can also request a meal made with organic products. There is a tennis court 3 km away. 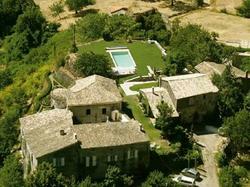 It is situated 43 km from Valence and its train station and 25 km from Montelimar. Please note that dinner is not available on Thursdays. This room is traditionally decorated and offers a garden view. The private bathroom is fitted with a walk-in shower. This room offers a private terrace with a view of the valley. It is traditionally decorated and has antique furniture.